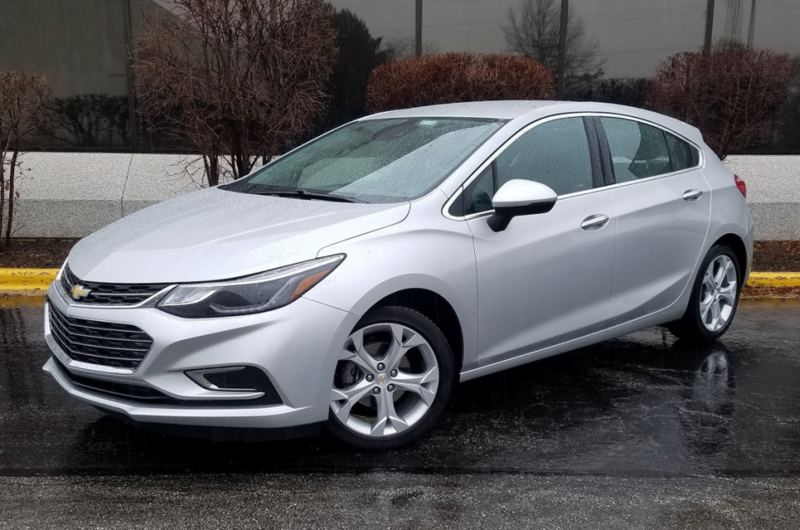 You don’t have to turn the new Chevrolet Cruze hatchback inside out to find things to not like. A few jump out, like limited rear leg- and headroom, and skimpy personal-item storage. Performance is . . . nice. If you stop there, though, you might miss a car that’s still pleasing and well thought out overall. Cruze Hatchback models are offered only in midline LT and topline Premier trim. Sedans can be had in less expensive L and LS trim levels as well. 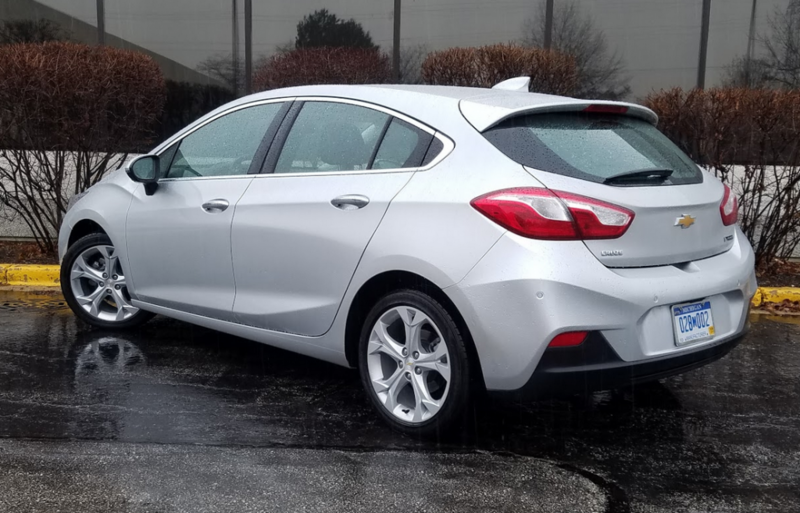 The hatchback is a new addition to the family of Cruze compacts—formerly all sedans—that was redone for 2016. It comes in two states of trim, LT and Premier (the sedan counts four levels), and it’s timely, with a miniboom in hatchbacks bubbling up in the car market. 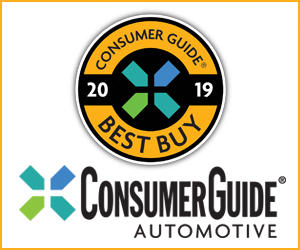 Consumer Guide® editors logged time in a Silver Ice Metallic Premier, which tops the entire Cruze roster with a starting price of $23,945 without options or delivery. The Cruze Premier’s cabin has a respectably upscale feel for a mainstream compact car. Front-seat passenger space is good, but rear-seat comfort is hampered by somewhat stingy legroom and a sloping rear roofline that cuts into headroom. The Premier powerteam is a turbocharged 1.4-liter 4-cylinder engine and a 6-speed automatic transmission. Other standard features include the Chevy MyLink infotainment system with 7-inch touchscreen, a 4G LTE WiFi hotspot, rearview camera, satellite radio, Apple CarPlay and Android Auto cruise control, keyless access and starting, remote engine start, 8-way power driver’s seat, leather upholstery, heated front seats and steering wheel, air conditioning, heated mirrors with integral turn signals, and 17-inch aluminum wheels. A new feature standard on LT- and Premier-level Cruzes is the Teen Driver monitoring system. Cruze Hatchback’s rear seatbacks fold nearly flat with the load floor, opening up the cargo area for larger items. Of course, there’s also more cargo room built into the hatchback. Loading requires negotiating a considerable lip at bumper level—don’t forget this is a car, not a crossover—but past that point there’s good flat floor space under the cargo cover. Rear seats are split 60/40 and fold very nearly flat. A connector panel between the seats and cargo floor makes sure there’s an uninterrupted surface for large loads. As for seating, the front row is roomy. Headroom is ample, and there’s plenty of power-adjusted travel to the seat-cushion height to maximize it. The picture is less rosy in back. When this 5’-10.5” driver sat behind the driver’s seat he had been occupying there was just enough room to sit fairly comfortably—but really none to spare—although many a compact is prone to that problem. The roof slope trims headroom, too. Anyone much over 6 feet tall will probe the limits, and even for this reviewer entry to the back seat required some ducking and scalp scraping. At least the doors open wide. A flat floor keeps alive the hope of three-across seating. 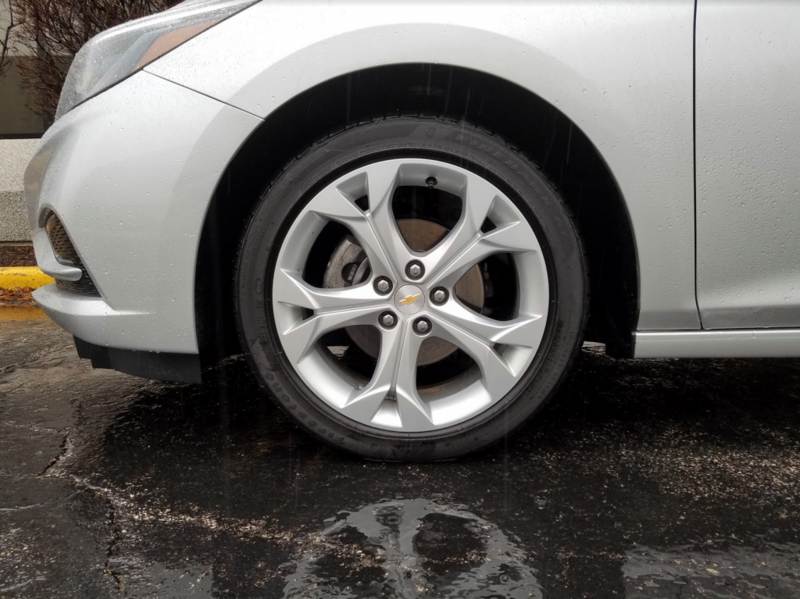 Seventeen-inch alloy wheels are standard on Cruze Premier models. 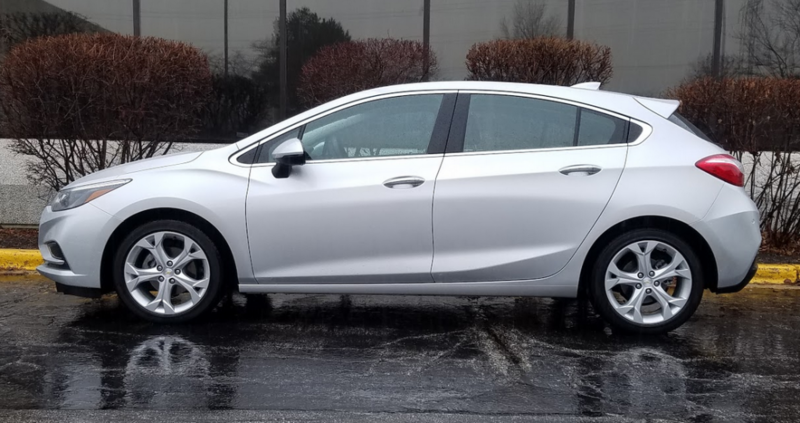 The overall look and feel of the Cruze Premier cabin might be said to be affordably sophisticated. Areas of the dashboard and door centers are padded. The tops of the doors and the dash don’t have any underlying give to them, but they do have a matte “soft paint” surface that visually blends in well with the other interior materials. There are bright-metal accents, and piano-black sections on the console and around the MyLink screen—the latter a touch that doesn’t enthuse everyone these days. Driving instruments are grouped in a “dog-bone” arrangement that’s similar to the clusters in other Chevy vehicles. A legible vehicle-information display fills the space between the larger speedometer and tachometer dials. Audio operation on the MyLink screen is easy. Climate controls have rotating knobs to set temperature and fan speed but rely on buttons to manage other functions. The turbo 4-cylinder engine puts out 153 horsepower. It motivates the Cruze adequately enough, just not thrillingly. At least the auto trans performs smoothly, kicking down smartly to aid expressway acceleration. Engine noise rears its head a little when the car is pushed hard. In general, though, the Cruze is admirably quiet for its class. It rides well with good bump absorption, steers with above-average precision, and corners without undue roll. This driver put 180.7 miles on CG’s tester, averaging 29.44 mpg with 58 percent city-type driving. That falls between the EPA mileage estimates for city and combined driving—28 and 31 mpg, respectively. On the highway, the Cruze with automatic is pegged at 37 mpg. Engine stop/start is incorporated to cut down fuel use at full stops. Even with a couple of option packages that brought things like automatic air conditioning, wireless smartphone charging (through a slot in the console), heated rear seats, and various traffic- and lane-monitoring technologies, the bottom-line price came to $26,475. The Cruze hatchback’s few shortcomings notwithstanding, it’s a worthwhile small car that’s easier to like than not. Almost 189,000 new-car buyers chose a Chevrolet Cruze in 2016–and all of those Cruzes were sedans. Expect the hatchback to broaden the Cruze’s appeal and lure more shoppers into Chevy showrooms. Written by: The Daily Drive staff on February 6, 2017.